Red Dot Auction VIII--Tickets Now Available! Save-the-date! The eighth annual Red Dot Auction is scheduled for Friday, May 11 from 7 to 10 PM! Tickets, $25 for main event and $100 for the Preview hour (5:30 to 7 PM) are available at ChuckJonesCenter.org/RedDot. You’ll find the cure for “Empty Wall Syndrome” at the Red Dot Auction. Over 100 artists from around the globe have contributed one or more 12” square canvases and 3D art objects to this special fundraising event. 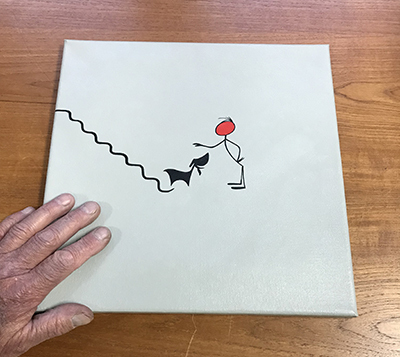 What differentiates The Red Dot Auction from other silent art auctions is that the contributing artists have signed their artwork on the reverse of the canvas. Consequently, attendees at the event will not know who the artist is when bidding, they’ll only have their heart to follow. Watch this space for a special announcement, coming soon! With less than two weeks until the Red Dot Auction, we wanted to share with you the stories of the artists who have donated art work (or in some cases, more than one) to this year’s Red Dot Auction. 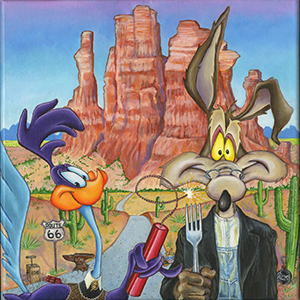 This fundraiser, now in its sixth year, benefits the programs of the Chuck Jones Center for Creativity. Today we feature artist Jamie Martin. (Jamie takes private lessons at the Center with its teaching artist, Denise Dion-Scoyni. )Jamie Martin is a 9th grade student and has a passion for creativity. When he was just under two years old you couldn't keep him from his Lego's if he had an idea he had already begun working on. Jamie loves animation and everything that goes into the creative process from beginning to end, there isn't any detail that escapes his interest. He is really honored to get to participate in the Chuck Jones Center for Creativity’s Red Dot Auction. Jamie has really benefited from the classes he has participated in at the center,and hopes to continue his artistic growth. He loves the Road Runner, Wile E. Coyote, and Marvin Martian. With less than three weeks until the Red Dot Auction, we wanted to share with you the stories of the artists who have donated art work (or in some cases, more than one) to this year's Red Dot Auction. This fundraiser, now in its sixth year, benefits the programs of the Chuck Jones Center for Creativity. Today we feature artist Michael Falk.Michael Falk is a retired Navy Chief Petty Officer and Iraq War veteran who in 2012 decided to become a storyteller through the medium of cartoons and animation. 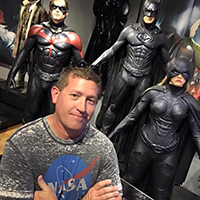 He holds a BFA in Media Arts & Animation from the Art Institute of Jacksonville and currently works in the Digital Production Department of DC Comics Entertainment, where he animates the digital front list covers for MAD Magazine and helps to create digital comic books for various platforms. 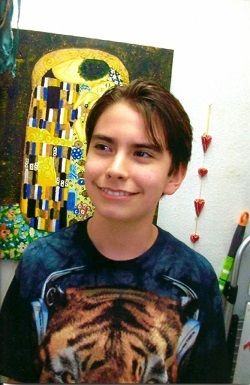 Michael also works part time as a painting instructor for Paint Nite and an animation teacher for Valley Torah High School. Will you go home with Michael's work at this year's Red Dot Auction? Be there to find out. Ticket's available at ChuckJonesCenter.org/RedDot. Pre-bidding is now available at Heritage Auctions, click here to place your bids. Online Pre-bidding for the Red Dot Auction Is Now Live at www.HA.com! Chuck Jones Center for Creativity has partnered this year with Heritage Auctions to bring you online pre-bidding for the Fifth Annual Red Dot Auction at their website, www.HA.com. Bidding is now open! Here’s your chance to peruse the delightful and impressive selection of artwork submitted by artists from around the country and place a bid on them! Bidding starts at just $100!Many of today’s giants of animation will be contributing works to the auction, including Eric Goldberg, director of Fantasia 2000 and the Genie in Aladdin; Kelly Asbury, director of the box-office smash Gnomeo and Juliet; Jeff DeGrandis, former producer of Dora the Explorer and now at DreamWorks; Academy Award winner, author, and NYU professor of animation at the Tisch School of the Arts, John Canemaker, and syndicated comic strip artist of Dennis the Menace, Ron Ferdinand. 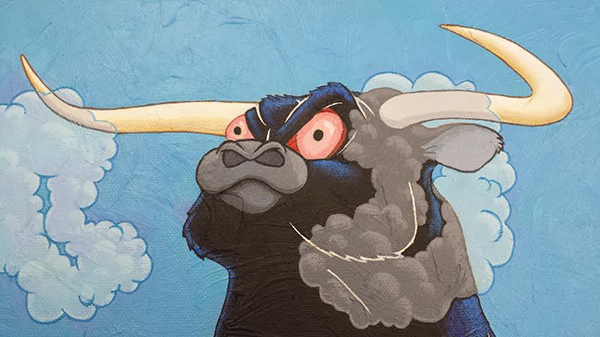 Popular contemporary artists include Tina Palmer,Fabio Napoleoni, and Joshua Smith. Bid early and often! This Just In! Red Dot Auction Update! Now the artist who created this painting (detail shown) is likely reading this post, so don't you dare identify yourself, it's a secret! The canvases are rolling in and we're starting to post the images here on the blog, click here to preview. We are expecting over 200 canvases this year--so, if you haven't made plans to attend, buy your tickets now at ChuckJonesCenter.org.